Recent years have seen a significant increase in the tendency for people to discard litter, and Radlett has not escaped this curse. The Radlett Society and Green Belt Association takes a prominent role in applying pressure on the authorities who are responsible for keeping streets and public spaces clear of litter, and can claim a measure of success. Regular checks are made in the shopping parades in Watling Street, in the streets and footpaths serving the residential areas, and open spaces such as Phillimore Recreation Ground and Fir Spring Wood. On occasions Society members have organised volunteers to carry out one-off clean up operations. 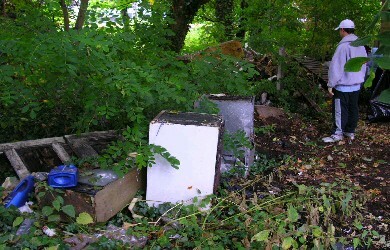 Of more concern is litter and other rubbish that is frequently deposited on private land, often close to public thoroughfares where it is visible to residents and visitors alike. The land behind the shops in Newberries Parade that can be seen from the bridge to the car park, and the land between the Station forecourt and shops in Watling Street, are cases in point. In these instances the Radlett Society tries to identify the shopkeepers and owners to try and persuade them to organise clean-up operations. When necessary, the Society will identify landowners using the services of the Land Registry. Helping to keep Radlett looking at its best can be an on-going and sometimes tedious business requiring vigilance and dedication. The Radlett Society is dedicated to doing all that it can to further this cause.